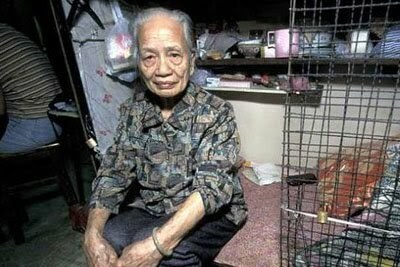 The cage that the woman sits in above contains all her possessions, from clothes to cooking supplies and even family heirlooms. 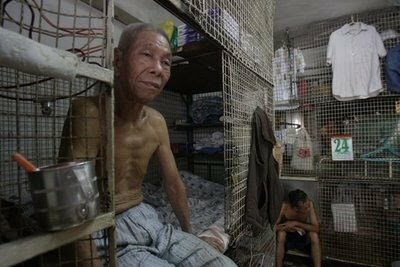 Realistically speaking, the cage is smaller than a jail cell; yet, these cages house thousands of poverty-stricken men and women who have nowhere else to turn. One wonders though why someone would choose to live like this. Most of these people have no alternative option. These are normal everyday citizens who befell upon hard times and ended up unemployed, homeless, and struggling to make ends meet. The horrific floods of 2008 didn’t help either, as it forced many into homelessness and poverty. 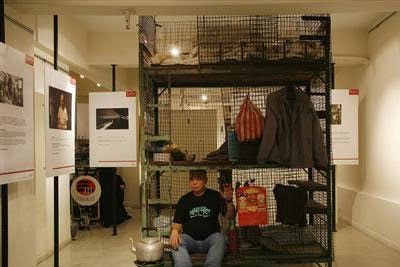 To bring this unfortunate situation to light, Hong Kong’s Schoeni Gallery decided to focus their annual art charity event on displaying these cages directly to the public. Their goal was to showcase the widening gap between the poor and rich in Hong Kong. The cages displayed are real cages from real flats. In fact, the man pictured above is Mr. Kam-chuen himself. He hopes that this event inspires more people to offer a helping hand to those in need — especially the poor cage dwellers of Hong Kong.